The Bruins are still undefeated… but also unsatisfied. 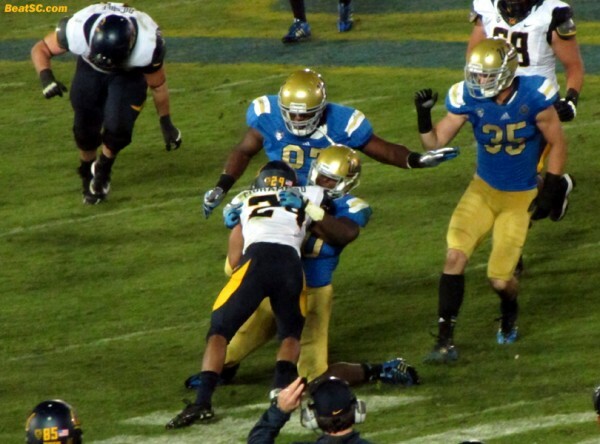 UCLA dispatched Cal on Saturday night without much trouble, but the Bears were 1-4 and decimated by injuries, so the Bruins were expected to win easily — and it wasn’t as easy or smooth as it should have been. 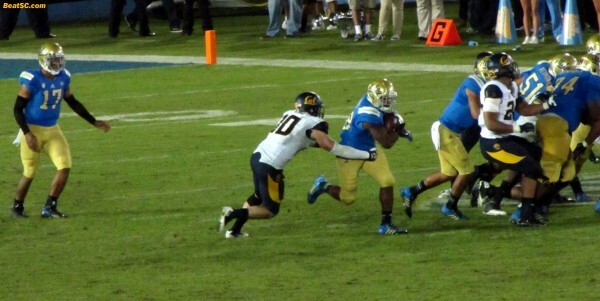 Due to #5 Stanford and #6 Georgia losing on Saturday, the #11 Bruins will probably enter the Top Ten tomorrow, but they definitely did not play like a Top Ten team on Saturday night, and will not be able to beat a Top Ten team with a similar effort. If starts with penalties. 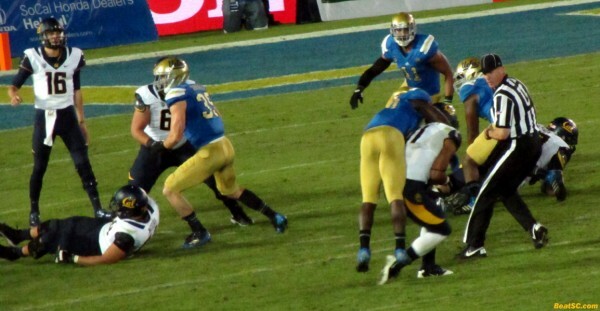 The Bruins not only committed 9 penalties for 64 yards, but they also lost a player for the whole game due to an infraction. Cassius Marsh was ejected for throwing a punch. 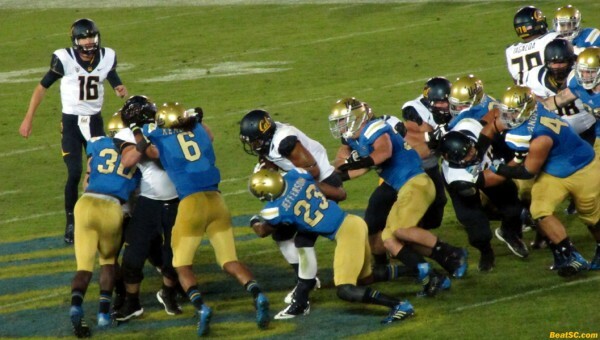 This lack of discipline is counter-intuitive when you think about Coach Mora’s attention to detail. But even he is flummoxed by this league-“leading” rate of penalization. 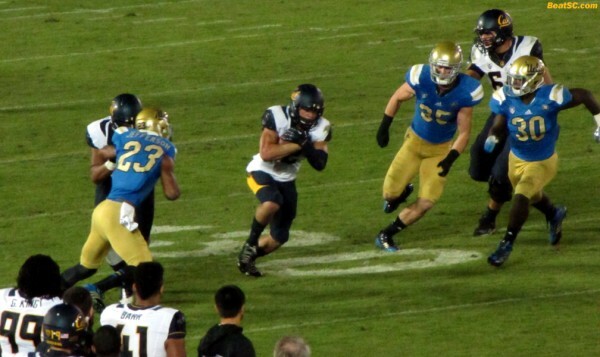 Yellow flags weren’t the only problem: The Bruins could muster only 78 yards rushing against a team that possesses one of the worst Defenses in the Nation. That could be explained partially by injuries to starting Tailback Jordon James and starting Tackle Torian White, but Paul Perkins is capable to fill in for James, and the rest of the O-Line starters should be able to open some holes even without White. 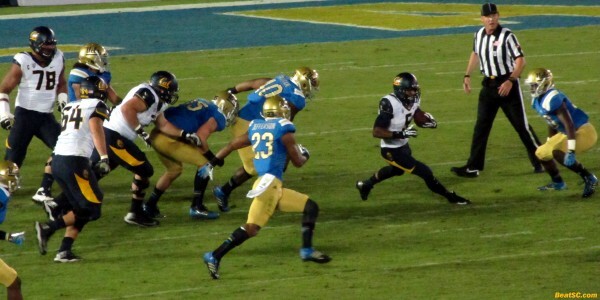 This was NOT the case — The Bruins did not have a single run for more than 11 yards. And even though Brett Hundley completed 31 of 41 for 410 yards including 13 straight, he also MISSED several targets, including multiple open Receivers who were either in the end zone or had clear paths to get there. I am not being too critical — The Offensive Coordinator and the QB both felt like the Bruin Offense left WAY too much on the table. I’m a little more proud of the UCLA Defense, who once again pitched a shutout after the Intermission. 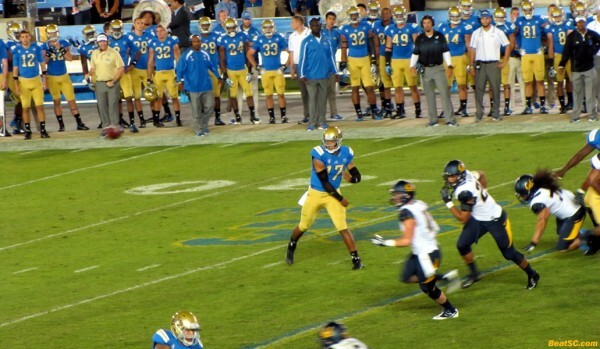 Anthony Barr and Myles Jack were huge as always, and Randall Goforth added a momentum-turning Interception. 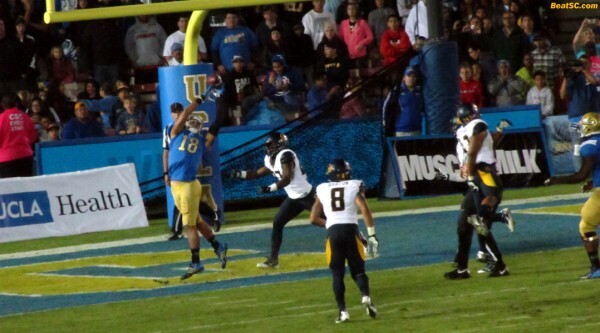 Fabian Moreau also broke up a long pass with good coverage and reactions. And you need to understand — even though Cal is bad, their Offense has been PILING UP yardage, against good teams too, especially through the air. 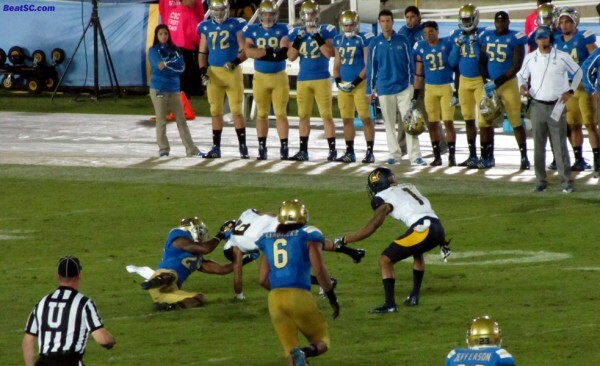 But they couldn’t duplicate that prowess against UCLA’s Defense. The Bruins got up 17-0 early, then gave up 10 points, but scored another 7 before the Half, and went on to win the 2nd Half 13-0. 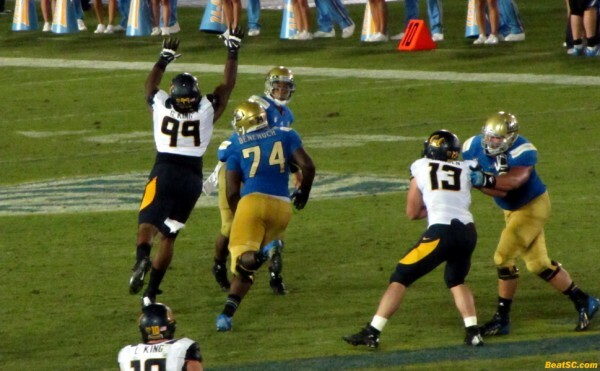 The Bears did have two long drives in the 2nd Half, one all on the ground, and the second one all in the air, as the Bruins seemed to get a little relaxed and “Prevent-y” — but they stiffened in the Red Zone and shut the Bears down when it mattered. Stanford lost in Utah on Saturday, taking the luster off the Bruins’ next game, which is Saturday in Palo Alto. 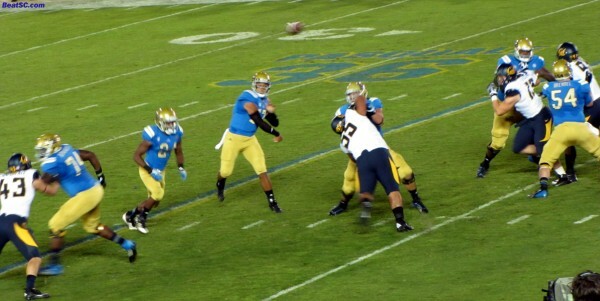 But UCLA will probably still be decided underdogs, and will need to show improvement in order to stay undefeated. 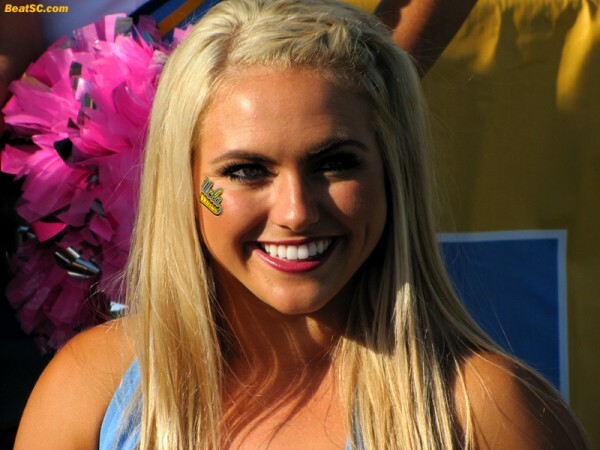 Here are 40 game and UCLA CHEERLEADER photos from the event. Click on them to enlarge. A couple hundred more Cheerleader shots will be coming soon, so check back frequently. 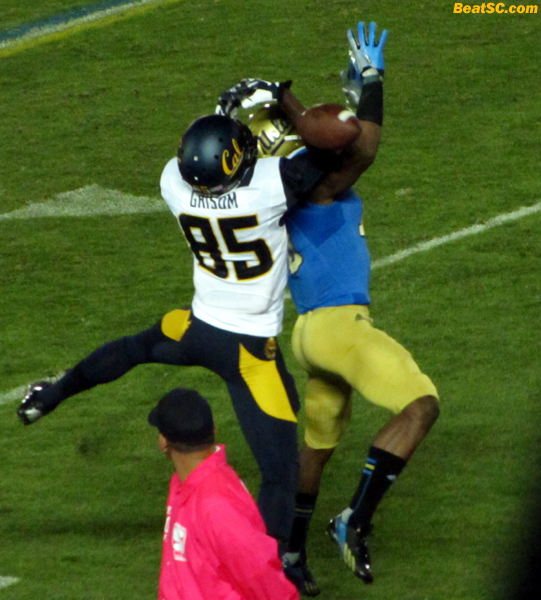 Myles Jack’s tight coverage couldn’t stop this completion, but at least there were no Y.A.C. This was Fabian Moreau’s aforementioned great deflection. 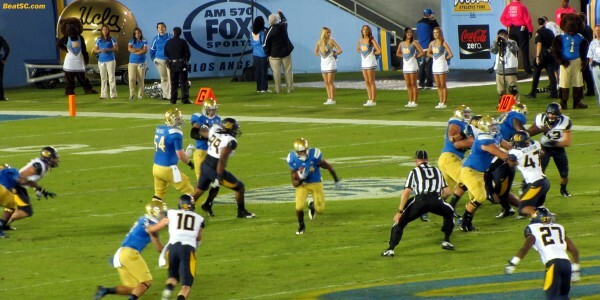 "SOLDIER OF FOUR-TEN" was published on October 13th, 2013 and is listed in Blue & Gold News, UCLA/usc/Cheerleader Photos, UCLA/usc/Sports Photos. It’s pretty much a consensus that there’s still a lot of things to work on. The sloppiness will be costly in the next 2 games. The penalties prevent them from gaining momentum on drives. On another note, the cameras were loving caroline and macall. So proud to have these girls represent ucla in the best light possible. 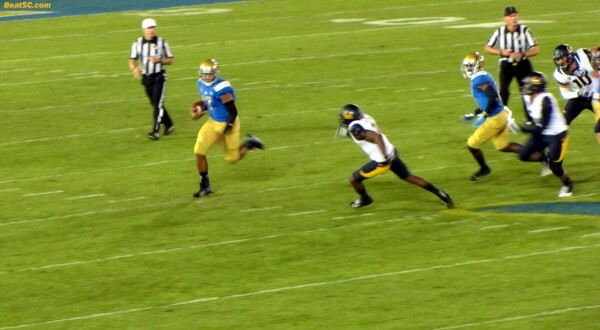 Hopefully UCLA was looking ahead, and their run game does not miss White THAT much. We shall see. Meanwhile, Stanford will start out favored by 4 next week.